Try clicking the window where the composition has opened (part of the Window which contains TaalMala logo). This window needs the focus in order for the play button to be active. By default, TaalMala shows the pre-composed Taals from the following folder: (Installation path)\Taals. However, you can change this folder via TaalMala options. The bottom-left corner of the TaalMala window displays the properties of the selected bol. You can adjust the sounds to be played on Tabla or Dagga, their emphases and duration. This is the most powerful feature of TaalMala and this is what differentiates TaalMala from most of the other Tabla softwares. There are two ways to compose a Taal with TaalMala. Using this method, you can compose any Taal, one bol at a time. In the top right pane within the TaalMala window, you can insert new bols by using either the menu Edit -> Insert or the menu Edit -> Append. Each time you insert a new bol, TaalMala inserts a new default bol with silence. You can then select the newly inserted bol and edit its properties in the bottom left pane. Once you have edited the properties of the bol, click on Apply button in the bol properties pane (left bottom pane) and the bol will be updated in the Taal. 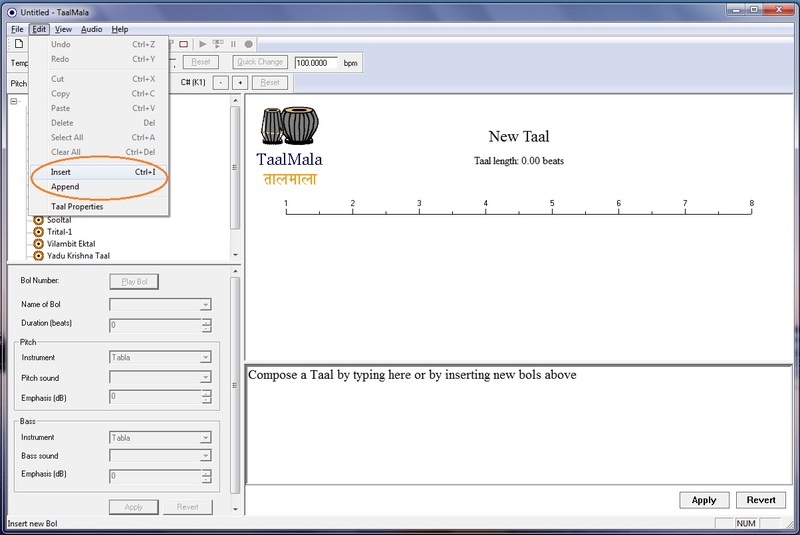 This is a newly introduced method of composing a Taal in TaalMala release 4.50. 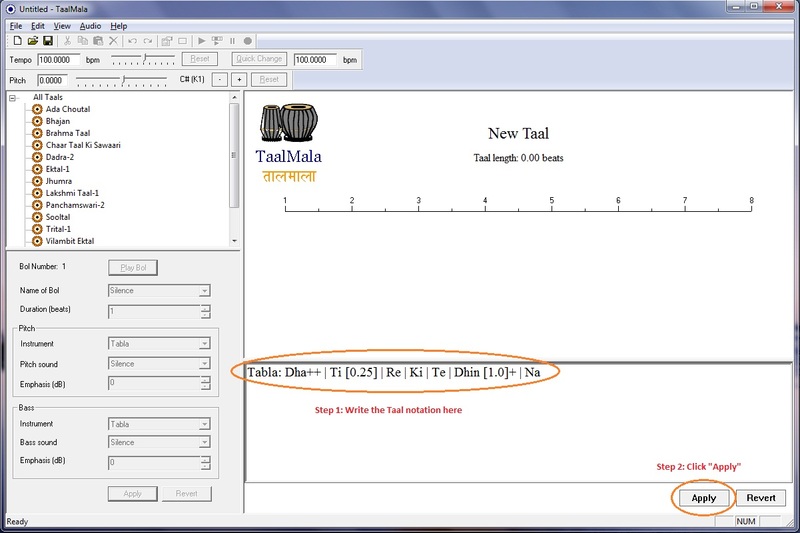 In this method, you can write the notation of the Taal in the bottom right pane of TaalMala as if you would write the notation in your notebook. TaalMala follows a very simple syntax for Taal notation (explained below). Once you have written notation for the desired Taal in the bottom right pane, click Apply button at the bottom right pane. 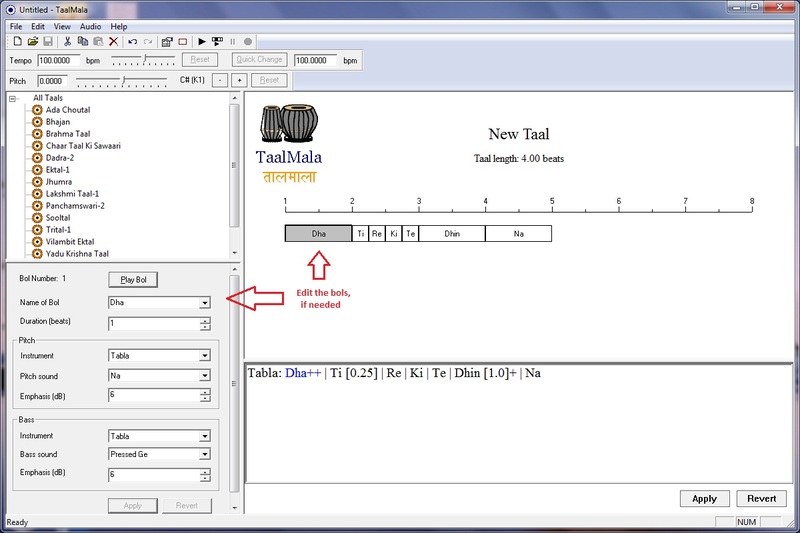 If your written Taal is in correct format (explained below), then the Taal will be transferred to the main top right pane of TaalMala and shown to you as a series of bols. The first word of the notation indicates whether the Taal is on Tabla or Pakhawaj (Pakhawaj is available only in licensed editions of TaalMala). For example, in the following example, we have composed Teentaal on Tabla. In the following example, we have composed the same Teentaal as above on Pakhawaj. As seen above, the name of the instrument (Tabla or Pakhawaj) is followed by a colon :. The instrument name is followed by a series of bols on the instrument, each separated by the vertical bar |. Each element in the above line highlighted in separate color is optional. Thus, you can specify just the Bol name or [matras] or + symbols for emphasis. You can also specify any combination of the above. 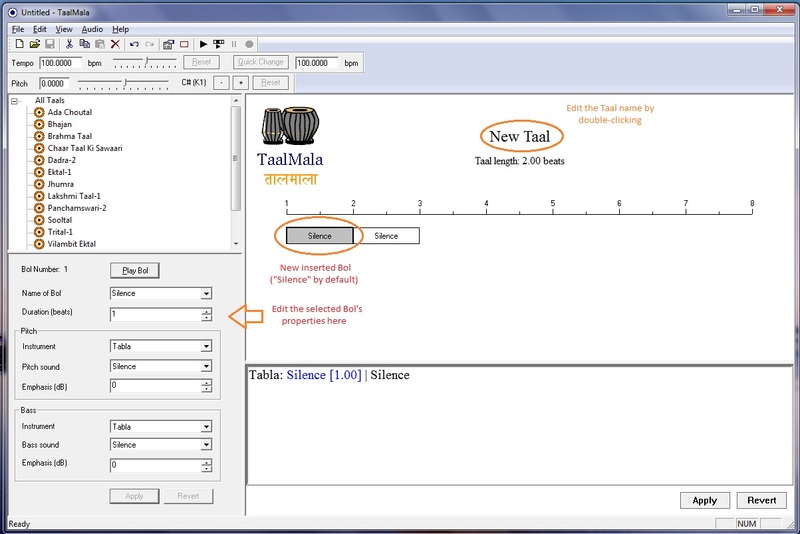 TaalMala recognizes most common bol names (list given below) and inserts correct sounds on Tabla (pitch drum) and Dagga (bass drum) automatically, corresponding to the bol name. The duration of the bol (in terms of number of beats or matras) is specified in square brackets  as a number. For example, Ti [0.25] means that the bol Ti is played for a quarter beat (1/4 matras). If the duration is not specified, TaalMala composes the current bol with the same duration as the previous one. Finally, you can increase the intensity of the current bol by adding a number of '+' signs to the bol. each '+' sign increases the intensity of the bol by 3 dB on Tabla and Dagga. If not specified, TaalMala uses the sounds without any additional emphasis. The above line creates a composition consisting of only two bols. The first bol is Dha, which is played for 0.5 beats (matras). The second bol is Dhin, with increased emphasis (+3 dB). Since the duration of the second bol is not explicitly specified, TaalMala assigns the duration of the previous bol to this bol too (0.5 beats). This example is illustrated in the screenshot below. The above line composes a Taal with first bol as Dha with 6 dB emphasis and duration of 1 beat. Note that if the first bol's duration is not explicitly specified (as is the case here), it is automatically assumed to be 1 beat. The next 4 bols are Ti Re Ki Te, each played for 0.25 beats (as is customary for the phrase "Ti Re Ki Te"). Notice that we have explicitly specified the duration only for the first bol Ti. The next 3 bols use the same duration as the previous bols' duration. The bol Dhin has extra emphasis of +3 dB and played for 1 beat. This is followed by the last bol Na, which is also played for 1 beat, without any additional emphasis. The above line creates Ektaal on Tabla with emphasis on Sum and Khali. The above examples should make it clear how to compose using Tabla notations in TaalMala. In fact, for accomplished Tabla players, it is an extremely fast method of composing the Taal. Once the basic framework is composed using the notation, you can always make subtle changes using the individual bol's properties. You can make TaalMala recognize additional bols or change the existing combinations by editing the files Tabla bols.txt and Pakhawaj bols.txt in TaalMala installation directory. To avoid losing the original file, however, we recommend that you keep a backup copy of this file before making any changes to it.